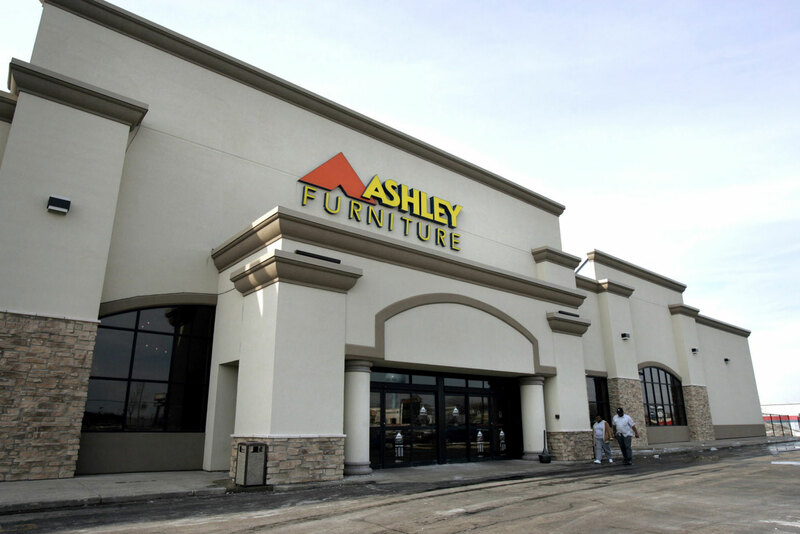 Ashley Furniture is the #1 furniture manufacturing company in the world with 500 storefronts in over 123 countries. There are production plants in China and Viet Nam. Revenues in 2015 were reported as over US 4.15 billion and employees worldwide number over 22,000. At one plant over 65 acres is under one roof. To reach customer service, call 1-866-436-3393 or find Support here. If you would like to contact CEO, Todd R. Wanek, you may address correspondence to him at: 1 Ashley Way, Arcadia, WI 54612, USA. The corporate office phone number is 608-323-3377. 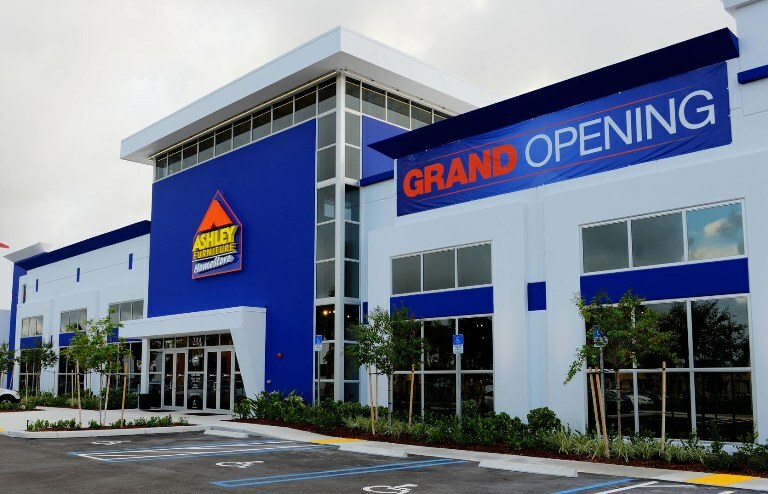 Ashley Furniture site is separate from the Ashley Furniture Homestores site. 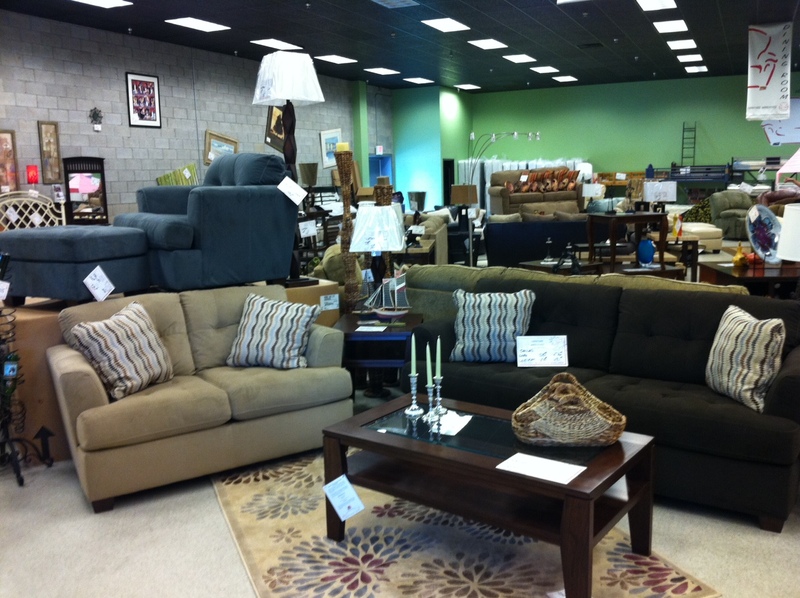 Ashley Furniture deals primarily with the construction of home and business pieces. By the year 2000 the Arcadia, WI plant employed more people than the city had population. Social presence for Ashley Home Stores is on Facebook, Twitter and Instagram. I’ve purchased several times from Ashley furniture and their delivery is terrible.. almost 2 months since purchased items and still haven’t been able to complete the order. Upholstered bed ordered mid-march for delivery March 26th, moved to 4/2/19 due to manufacturing delay. Arrived 4/2, only be partially assembled due to missing pieces. Parts ordered, 7-10 days for delivery. Day 11 I called was told indefinite delay, no ETA. Been sleeping on floor for 14 nights. 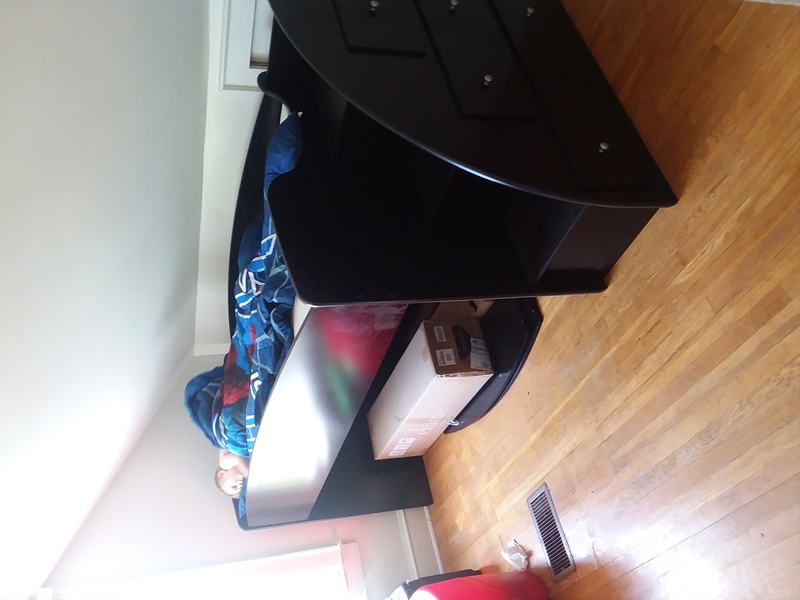 No eta on parts, June backorder on just the footboard, replacement bed backorder until June, will not take bed back without a 10% restocking fee. I'm at a loss....the bed is paid for, I've slept on the floor for two weeks with no end insight. Good morning. I am writing this letter in reaction to an experience we recently had at the Farmingdale New York store location. Firstly, my wife who is 7 months pregnant went into the store a few days prior and picked out some furniture. I returned to the store with her on a different day and we asked to speak with the same representative, who's name was Donovan. He came up to us and politely explained that he was with another customer and he would be with us shortly. Soon after that, Bill approached us and told us he would be assisting us while Donovan was working with another customer to "speed things up a bit". While Bill was assisting us we were approached by at least three other people who also began working with us as well. During this time, the communication was terrible and Bill ran back and forth multiple times changing numbers again and again. While we sat and waited the other sales reps. and other individuals also came and spoke with us. It seemed that the communication was minimal and that working with multiple people caused a lot of confusion. The numbers for prices etc. had to be changed again and again while we sat at a table wondering what was going on. It came to the point where we were given multiple prices and then Bill would disappear with the initial writeup and then reappear with a completely different write up. While this whole process was taking place, Donovan asked us to walk over to a section of the store to speak with the manager as he was instructed to do so by the manager. We went to the middle of the store and were asked if Donovan had asked Bill to come and work with us or if he took it upon himself. We had no idea at this point and felt very uncomfortable standing in the middle of the store having what seemed like should have been a private conversation between the team at Ashley's and should not have involved us. After about three and a half hours everything finally seemed to be in order, my wife was asked to sign off on a few papers which were poorly explained and laid out for us. Finally we left the store with our purchase and our receipts. Again, we were still very confused and uncomfortable at what took place at this point. When we were just about home which was about 30 minutes away we received a phone call saying that they forgot to charge us for the $598 mattress which we had purchased along with our bedroom set and couch. We had to drive all the way back to the store to figure out the issue. I stood waiting for two sales reps. and the office staff figured out what had happened. While printing the receipt the printer broke down and I was left waiting for another half hour while the issue was resolved. In all, this was a horrific experience for both myself and my pregnant wife. We hoped to come in and make a purchase and walk out happy customers but we are truly disappointed and left uncomfortable with the events that took place. We spent nearly $6,000.00 and feel that we should have been treated much better throughout the process. Please let me know what can be done to resolve this issue. I thank you for taking the time to read this letter and to address our concerns. We purchased a loft bed from the Capital Blvd. store in the beginning of March. I explained then to the salesman I had done business with Rooms 2 Go for years but because of a recent delivery that went very bad I would not buy from them anymore. I was told not to worry that Ashley Furniture had hired a new logistics company with professional installers and would not have any issues. The furniture was delivered on March 21st. My wife and mom were home for this delivery as I could not be because of work. During the delivery my Mom questioned the installers about several loose bolts and handles being put on the chest of drawers. For the chest of drawers she was told that was not their job and responsibility of the homeowner. On the bolts she was told they could not tighten them as the bed was assembled. When I got home and inspected the furniture there were several nicks in the wood and almost half of the hardware was missing and not installed. I first called the store and was told to call customer service and after speaking to 3 different employees there spoke to a manager that provided me the number. When I called the number it was non-existent. I called once more and there were no records of any previous conversations or calls as I had explained to them about the unacceptable delivery. So, I then went by the store and the manager had given me a bad number but explained I must deal with customer service even though the sale came from this store. The next day I spent hours on the phone with several employees and was told to send photos immediately so we could get this resolved. I sent photos to 2 different customer service reps and never got any response. I called again to follow up and no one there knew the other reps I spoke to and was asked to send to a different email address. I forwarded the many detailed photos to that address. At this point I asked just to have the furniture picked up and I no longer wanted it from them. After the rep looked at the photos she stated she could clearly see where hardware was missing and the various damages. She offered to send me new pieces and in return compensate me for all the troubles. She also stated they would not discuss compensation until they had made a good delivery. 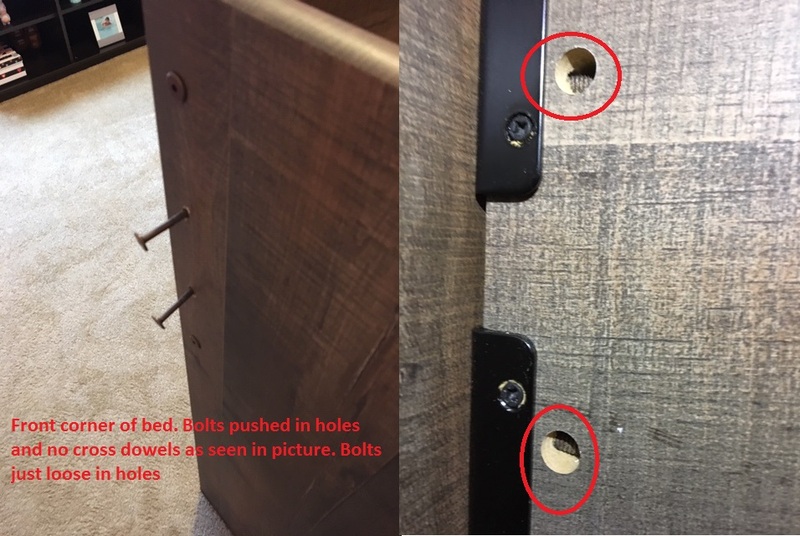 I was most upset for the fact that where most of the bolts were missing were the boards that actually hold up the mattress. I explained my 5 yo daughter or one of her friends could have been injured if this fell. I agreed to receive a 2nd shipment with the understanding of compensation. Today April 9th I received the replacements. The delivery went pretty good but the installers struggled a bit to put this together. I did observe them the entire time to make sure it was right. I was satisfied with the end result. Later this afternoon I called customer service to discuss my compensation. Then I was explained that their compensation is in the form of a gift card to purchase more furniture at the store. I explained this was not acceptable and was looking for something that assisted towards this purchase. I was told after speaking with a manager they would take $50 off this purchase. This was a huge slap in the face and I told them to keep their card and the $50. I will not ever be doing business with Ashley Furniture ever again. I explained if I had known compensation was a gift card to buy more furniture I would have just had the original shipment returned and been done. This is very poor service and feel I was mislead throughout this entire process. I am not one to complain but I am new to the Savannah, GA area and decided to purchase my new furniture through Ashley which was the biggest mistake ever. I spent almost $5000 for an entertainment center and bedroom suite. I had to wait 3 weeks to get my furniture which is way longer then any other place I looked into. They were to call me a week after my order with a delivery date and that never happened. I had to call them and finally got an answer after 2 weeks. The delivery time was 12:30 to 3:30 the following week and they called me hours ahead of that and said they were on their way. I wasn't home so they tried to reschedule for another day. I explained the time they gave me and they said I should have answered my phone and I would have known they were coming early. I was able to get the number for the actual delivery guys and talked to them and they said they would be right over. ( Independent contractors were so nice and helped me out more then Ashley would) When I finally had my order delivered it was wrong. My mattress was delivered to the wrong address days before by the actual Ashley store and when my neighbor said something to me I realized they had my mattress. Even though it was wrapped in plastic it had stains all over it. The bed that Ashley sent was wrong. I ordered a platform bed that didn't require a boxspring and they brought a normal slatted bed that I couldn't even use. They also forgot to send my end table that I spent an extra $300 for. 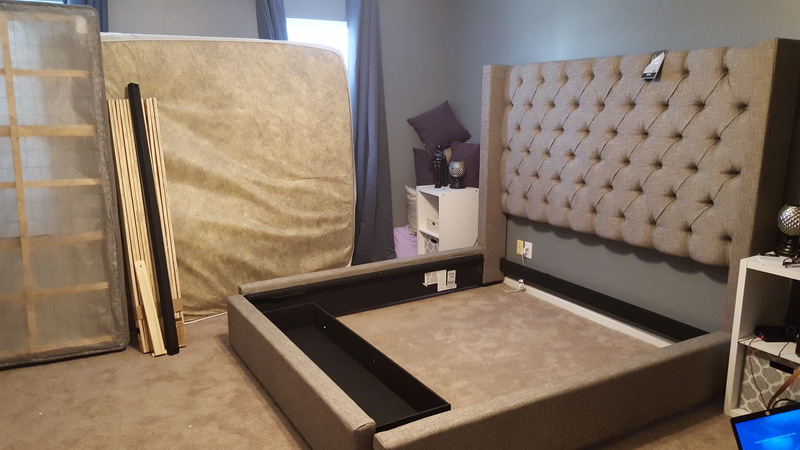 When I called Ashley they said they would order the correct bed and another end table and told me to get some plywood to throw on the bed they brought so I could use it for the next month until I get the correct bed. Needless to say I don't have the time or money to be buying wood and trying to make it fit on a bed that I didn't even order so we are sleeping on the floor for the next month. The worse part of it all is this is my first experience with Ashley and the mistakes were made by the store and they will not do anything to try and help with the situation. No compensation for the major inconvenience or trying to rush my correct bed so we aren't on the floor, absolutely nothing. This is the worse experience I have ever had buying furniture and I will never go back to any Ashley store. The customer service is horrible. It took me over an hour to even get anyone on the phone when I first tried to call about the issue. The delivery guy was the one that was finally able to get someone on the phone for me. That is not acceptable at all. The lack of customer service and willingness to help their customers has cost Ashley a customer and a lot of money as I planned on buying the rest of my furniture to furnish my new home from them but have decided after this experience to go somewhere else. I really hope that something is done about this so no one else has to go through this. I really didn't want to have to write this letter today, but I am extremely disappointed with my ongoing experience with Ashley Furniture. Many years ago I had a God Awful experience with Bob's Furniture and I swore I would never purchase from them again. So when the time came to purchase a new couch, I decided to go with Ashley because the quality seemed much better. Little did I know I would find myself saying Never Again. I purchased a couch on March 16, 2018 in the Paramus NJ store. The delivery for the item was not until April 1. This was far out, but because we were having work done, I agreed to the date. My husband and I took an unpaid day off (which equates to over half the price of the couch) to meet the delivery guys and get everything in the house. On Sunday March 31 we never heard from Ashley about a delivery time. We figured, as with some places, we might hear in the morning. The saleswoman said that deliveries started as early as 6am and an alert would be at 5am. I awoke at 5am and heard nothing. I was not able to get a human being on the phone until 8am. Once I did, she stated that we had no delivery scheduled for April 1 (despite my paperwork confirming it). She stated that the couch was back ordered and wouldn't arrive in the warehouse until April 22. Delivery won't take place until after that. NO ONE contacted us. I was told over and over to call the customer service back to "find out what happened". Each time I waited on hold for one hour and nothing was determined or resolved. The first time I was told to call back at 9am when the store opened. When I called back at 9, the new person said that the store didn't open until 10 and to call back again. Once again this is after WAITING FOR AN HOUR. I called back at 10. They called the store and I was told that the manager named Kelsey from the Paramus store would call me to discuss my options. She was supposed to call me within a few hours. She NEVER called me. I was told to call customer service if I didn't hear anything which I did. I waited on hold yet again. Yet again no information was given. The kicker in all of this is I am 8 months pregnant. The only reason I agreed to all of this was that April 1 would be the latest we could take the delivery without causing an issue. This pushes it way to close. I won't have anyone to accept the couch. So now I have a couch coming more than 3 weeks late to a house that won't even be home to accept it. I have been sitting on the floor as there is nothing else in the room. So I want to thank you for that as well. I thought Bob's customer service was bad, but the fact that I cannot even get anyone to call me back to find out my options is absolutely unacceptable. I was originally so happy with my purchase. I recommended it to a friend and co-worker. He ran over to the store and ordered a bunch of furniture for himself. His delivery is in the next week and I have greatly encouraged him to cancel the order. I don't want him to go through what I went through. The best part of all of this is I work for an international media and news organization. After reading MANY MANY other complaints, I am ready to share this story with the legions of producers that I work with and know in other organizations. No one should be treated how myself or the tons of others I have read about. Something needs to be done about this. I would NEVER have gone with Ashley if I knew this was going to be the outcome. Customers really should be your top priority and from what I have seen that is the furthest from the truth. My wife and recently purchased a bedroom sets from the Ashley in Southhaven Ms. Purchase was made 2/4/2019. Delivery was made to 4545 Sweet Whisper Ln. Memphis Tn. 38125 everything was delivered except our Five Drawer Chest / Starmore. Since then my wife and I have been told weekly that this item will be delivered. We are receiving emails and phone confirmation that it will be delivered. But it is always some problem the day of delivery. We have spoken to your associate that work at the Southhaven branch and they tell us the same. It will be delivered. We have made our first payment towards this bedroom set and want to keep it. Can you please see into the problem is. Thank you. I had one of my most terrible experiences of my life last night at Yorba Linda Ashley Furniture Store. On 2/13/2019 I purchased a complete bedroom set from this store. Sale Associate(SHER AHMADYAR) AND the disrespectful, rude STORE MANAGER (CHARLES HAMILTON). I chose exactly the FLOOR SAMPLE Bed set. The Bed, Vanity/mirror plus the drawer were available to be delivered plus ONE night stand. Sales guy Sher Ahmadyar told me, out of 2 nightstands one nightstand will be delivered and the other nightstand will be back order and I will receive the secound Nightstand on 3/18. At the time of delivery they said none of nightstands are available SO both nightstands are backorder! and they told me that your sales person gave u wrong info, they are going to be delivered on the 25th.... I had 2 rounds of guests who came from out of state to stay at my house and I counted on at least ONE night stand by their bed! While the sales person SHER AHMADYAR ignored my calls and texts on his personal cell phone which he provided me also ignored all messages that I left him at store to follow up my case and give me a correct delivery date. ... finally on 3/27th ( ONE MONTH AND HALF AFTER PURCHASE DATE) I got the delivery of 2 WRONG ITEM, totally different nightstands that where not even on the floor as sample when I placed my order!...by trick and dishonesty he invoiced and sold me the cheap nightstands... I clearly pointed at the nightstand that was sitting by the bed set that I ordered and he invoiced a cheap version of the nightstand that matched to the bed set I ordered , hoping that I am stupid enough, or have poor memory or I wont follow up or i wont even notice that difference between what I had ORDERED and what I RECEIVED!!! since I was at work.. my son had signed off the delivery, getting home from work I saw the wrong nightstands and rushed to the store to get to the bottom of this matter …at that point I was still thinking that a mistake has happened and they will apologize and fix the problem. after I realized that it wasn't a mistake , it was a true decision that sales person had made with support of the manager, with hoping that I don't realize it, I asked them to correct their wrong action … solve the issue .. take away the cheap nightstands and deliver the right items ASAP.. and they both started ridiculing and teasing and ignoring the issue … other costumers started inquiring that why I am unhappy and they told each of those costumers that it was a honest mistake and they gonna fix the issue, they will make it up to me, will send me home happy and they distracted other costumers who were concern about me and didn't want to experiencing the same tragedy … then both MANAGER AND THE SALES GUY teased/ridiculed and ignored me, still I stood there for over ONE HOUR and I was keep asking them both " WOULD U SOLVE THIS MATTER? I HAVE A KID AT HOME I NEED TO GO TO MY FAMILY, YOU GUYS CANT IGNORE ME " (hopefully you can watch the whole scenario if the store has the surveillance system .. the way the store manager, CHARLES HAMILTON conducted this matter was so unprofessional, very humiliating, so disappointing and absolutely disrespectful, a true example of charlatan act, we do not have and accept this attitude in my town yorba linda. (teasing and laughing at the costumer... hoping that I get tired and leave the store ).. I stayed bc I needed an answer or a fix .. I deeply feel tricked and been rubbed financially and emotionally... I stayed and stayed... CHARLES HAMILTON came to me and said leave the store or I call the police … I stayed and said u need to fix this … apparently it wasn't a mistake and it was a true decision on tricking the customer so I stay till u fix this matter.. he called the police ! whilw I was talking to the Yorba Linda police officers,even they were surprised regarding the way SHER AHMADYAR and CHARLES HAMILTON conducted this OBVIOUS matter....TO TRICK THE COSTUMER, DENY IT, NOT WILLING TO FIX IT, TEASE AND RIDICULE THE COSTUMER, AND CALL THE POLICE !! looking at the bedroom set in my house just makes me sad and disappointed of humanity and respect.. I am a professional citizen, a surgical nurse in ophthalmology department at YORBA LINDA Kaiser permanente , taking care of other human being equally from heart with respect, high quality care and service and with work ethics and passion... that's how I make a living and take money home to my family, up on my feet from 5AM to 5PM serving all patients equally. There is no way I can tolerate such behavior and attitude, tolerating this way of conducting business, this way of tricking other humans and sit quiet so these 2 Sales person and his manager keep this awful attitude, trick more people, rub other people financially and emotionally like this . apparently they dont deserve this job, they need training to learn about work and bussiness ethics, respect and humanity, AND TO MAKE MONEY RIGHT WAY. Yorba Linda is a nice city with respectful folks living in it, its OUR TOWN. I have at least 50 family members 60-70 friends and many many people (as my patients) live in this town and we have been in Ashley many times ... Ashley Furniture store has been in our town for so long , ofcourse with better service, reasonable sales people UNDER SUPERVISION OF REASONABLE STORE MANAGERS with work and bussiness ethics. Yorba Linda residents have been experiencing honest, pleasant, respectful and friendly customer service in this old stablished town, we do not have tolerance for such humiliating attitudes and behaviors that CHARLES HAMILTON AND SHER AHMADYAR had with me last night. I am impatiently looking forward to talk to the main responsible supervisor who is in charge of these sensitive matters FIRST to Clarify the details regarding my case and the way I have been treated in the store SECOUND to make sure hopefully no one else experience such terrible behavior and attitude. ASHLEY deserves better TRAINED representatives in their stores as MANAGERS. PLZ Contact me ASAP, Sincerely, Mona Merati. Was a big fan of Ashley's furniture until I bought my living room set ..
We keep getting the run around. I have logged over 4 hours of on hold time and still no resolution. I should have read the yelp reviews (Yelp Ashley furniture Rohnert Park, CA) before I purchased over 6k of furniture. Detailed Yelp review coming soon. I have been waiting for service on my chair for over a month (for a motor) almost a month before to get it checked, now they have no appointments to replace the motor in my chair until April 10th. No appointments on my days off-Mondays or Saturdays. I just cannot believe that Ashley's furniture is so bad that the repair people are booked for almost three weeks? I will never, never, ever buy from your company again. I spent a lot of money on two chairs and I cannot get serviced better than this. I am very angry and disappointed and I will tell people what I think about your company. Facebook is next. The reclining sofa we bought from them in September 2017 the cushions has broken and there is no replacement for them. The store cannot help. We cannot find no one in corporate that would be willing to help. We paid over 2000.00 dollars for this sofa. The furniture is no good. Someone needs to know this. All we want is it to be fixed or replaced. I purchased several pieces of furniture over a month and a half, and it has not yet been delivered. I have placed several telephone calls to the store, and left several messages for my salesman, as well as, the store manager, and I have not yet received a telephone call back from the store to address my concerns regarding my purchases. I am very disappointed, at the level of customer services that I have received since this transaction started. Which is very frustrating and has caused me many problems, as a result. 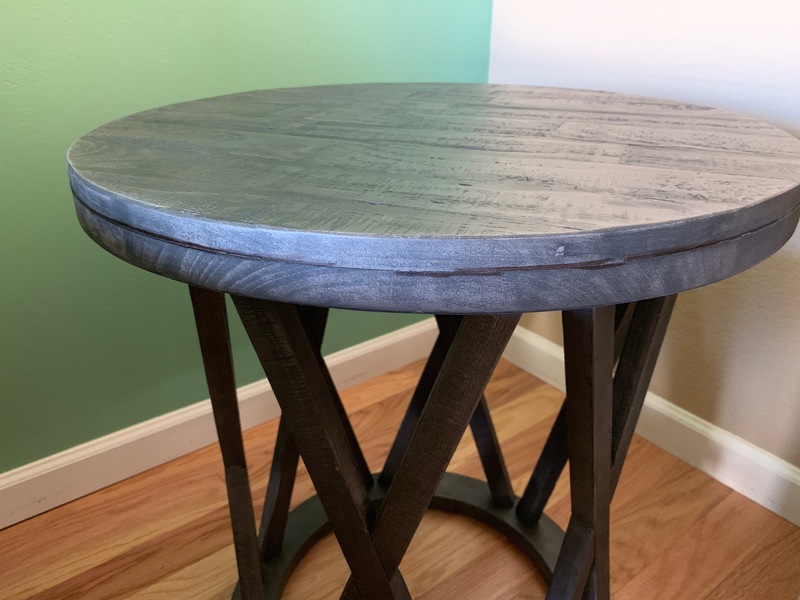 I was notified by the salesman several weeks after the order was placed that the tables were discontinued. As a result, I had to select from the floor display. Which was two weeks ago, and the furniture has not arrived. I will be visiting the store in person on Monday March 18, 2019, to cancel the purchase. This is very unprofessional, and I will never do business transaction with this company, or refer a friend. Verbally demeaned and challenged by a manager regarding a purchase I made and had delivered on January 2, 2019. I have been in co tact with the store and customer service multiple times. I had a brand new mattress with a hole I it, took about two months to get a replacement. I had a broken wall shelf delivered that I had to return to the store. I was also missing a piece of furniture, an armoire. K also a a Lee’s than par sectional that lost form in all the cushions, appeared lumpy and unfilled. I had to make multiple calls and talked to assistant managers and was shuffled between them. I was finally contacted by the general manager, Her name was Naieshia. She was truly unprofessional and challenged every complaint. She was not apologetic because she was actually argumentative. I felt so demeaned and belittled as a customer. I am truly disappointed I’m Ashley furniture. I would like to file a formal complaint. I have never been so disatisfied with a purchase. I will never recommend or buy again with your company. Please contact me at 901-319-4889. My name is Arthur Green I purchased a king size tempurpedic mattress from your Ashley's Home Store in Tupelo MS on January 4, 2019, which was delivered January 12, 2019. As a selling point, my salesperson, Keneisha, told my wife and I we had a 90-day trial period on the mattress. She said that we could try three different mattresses within those 90 days if we were not satisfied. After a month, we decided to try a split mattress; therefore, we contacted the homestore and our salesperson, Keneisha. She gave us a contact number to call to arrange the mattress switch. My wife was told to take photos of the mattress without the sheets or coverings and email to Lisa. After not hearing from anyone for several days, my wife called and was told that we needed to take photos with the mattress' law tag included. We searched the mattress for the law tag and could not find it. We called customer service again and was told that they could not honor the trial period without the tag. After going to the homestore to locate and identify the law tags on other mattresses, my wife spoke to Cora, who in turn sent an Ashley representative to my house to look for the tag on the mattress. My wife explained that Ashley deliverers set up the mattress and it has not been moved. When we purchased the mattress the salesperson nor anyone else told us we must visually inspect for a law tag upon delivery. The representative confirmed that the tag was missing, and called Cora at the store to say that the mattress was delivered with no tag. The representative explained that it was the deliverers's responsibility to ensure that the bed and mattress with the law tag was properly set up and tested before departure. Cora called my wife to state, not to worry, she would speak with management and everything would be taken care of since it was obviously delivered without the law tag. We thought the problem was resolved until the store manager, Chad, said that tempurpedic will not take the mattress back without the law tag and therefore Ashley cannot honor the contract. Please, Sir or Ma'am, I am a retired United States Marine Corps combat veteran diagnosed with serious nerve and spinal damage along with sleep apnea due to combat stress. I purchased this mattress believing it could help with my medical condition. It is hard to believe that a trusted company such as Ashley Furniture delivered a mattress without a law tag which may possibly be a used mattress. In addition, Ashley refuses to honor the contract, and voids the warranty to a five thousand dollar mattress due to their own negligence and delivery. Please look into this matter and properly resolve it by delivering to me a new warrantied mattress with the law tag attached. I ordered a 3 piece living room reclining set and 3 piece table and end tables on Feb 9, 2019 from the Ashley Furniture Home Store Outlet in Charlotte, NC. The delivery date was initially scheduled for Thursday, March 7 but I had to change to Saturday, March 9th, with a delivery window of 8:30 - 11:30 am. So naturally I had all the old furniture removed as instructed on my sales order terms and conditions in anticipation of the arrival of my new furniture. As I'm writing this, it is now 3:40 pm on Saturday, March 9th, and I have no furniture, no phone call or text from Ashley Furniture Home Store or the delivery company contracted to deliver the furniture. I did call the local customer service at 2:12pm and spoke with Shaniqua, who advised they were running behind....no kidding!!!! If they were running behind, common courtesy would have been for them to call and let me know there was a delay in the delivery time. This is my first experience with Ashley Furniture and probably will be my last. My wife and I went to the local Ashley Furniture Store in our town of Spartanburg, SC. The salesman was pleasant (Lee was his name) and so was the manager. We saw the furniture we wanted, in the color that we wanted and paid cash for it before leaving. We were assured that our furniture would be delivered on the 9th of February and that we would receive phone calls prior to the delivery. We did get a phone call from the warehouse telling us that our furniture would be there in two days on the 7th of February. So..... we gave our old furniture away in order to make room. On the 8th Ashley called and said that our order had been put off until the 23rd. Reason stated: "supplier production insufficient" or some equally bad lie. (They gave our furniture to someone else who wanted the same thing but financed it for a higher cost is what I supposed). Well, when I called and told them that we had already given our old furniture away and had none to sit on they could off no resolve. I asked if they had something we could use in the meantime and they said they don't do that. I told them that I wanted a refund then so that we could at least buy something to sit on until we decided on something else. They said that they could refund our money but there would be a 10% restocking fee. I hit the roof! A restocking fee when the furniture that we ordered hasn't even been made yet, according to them! In addition to the restocking fee it would take another 10 days to receive our refund by mail. What a bunch of B/S. DO not buy from them. AS far as I'm concerned they should be paying me for wasting our time! Instead, they made money off of us and did absolutely nothing! Do not buy from Ashley Furniture in Spartanburg, SC. I purchased 4900dollars of product from a local Ashley retail store on2/4/19 was delivered on 2/07/19 upon the technician assembling the bed we notice a big gash on the headboard also,also the matterss that was purchased is too firm on my lower back which makes it discomfort,I'm very displeased with customer service whom I talk with 2/07/19 she whom gave me a name of Legia I spoke with on the phone she told me she had 7 of the bedroom set I bought(headboard was in stock) that she was going to contact me back Friday on 2/08/19 have not heard anything back. I'm very displeased I would like to return my bedroom due to the unconcern.my sale order number 2784239326. I ordered a what I thought was a dining room set, turned out to be just a table. I have been trying to return it since the day it was delivered and have waited on the phone numerous times, with wait times of 30 plus minutes. Scheduling a return pick up, and then on the day of the scheduled return pick I received a text and email saying that the date has changed to pick it up. I called to talk to someone about this change and have waited 30 plus minutes just to be told that I had the wrong department, and then transferred, and told the same thing, WRONG DEPARTMENT. I will never own a piece of Ashley furniture, not will my children, nor theirs, and anyone else I can tell about such horrible service, I am posting this all-over social media, and contacting corporate. my family has been purchasing furniture from you for many years and have never been informed that if something did not fit or the color did not work out that you could not return it. They highlighted other statements on the form, but not that one. I think that should be the first thing they tell you considering every other furniture store lets you return with a small restocking fee. I even told the sales clerk that I was not sure if it was going to be to big or not and she never mentioned anything about making sure it was going to work out because we have a no return policy. Very disappointed and will probably never return. I would truly love a response back. During August 2018 I purchased furniture in the amount USD7284.35 to be shipped to my home in Trinidad. The items were purchased at your store 1301 W Osceola Park, Kissimmee, FL 34741. Before purchasing the items it was confirmed that I would be able to claim for a tax rebate since I have now already paid taxes in my country upon importation. I have been working with the store manager completing forms and provided the Bill of Lading document as requested. After following up, today I still haven't received a proper response nor have been able to settle the rebate. I am reaching out to your complaint center as the next step in escalating this. but only got voices mail still. I left a another massage,They said they would call in 24 hours just a lie. Finally in about a three weeks someone called and gave me date but no time. My complaint is have to take off from work to get this done. I sent this e-mail to customer.care@ashleydirect.com but it didn't go through. This is the e-mail that the lady on the phone gave me. When it didn't go through, I got angrier. Here is the e-mail I tried to send earlier this evening. I hope someone responds. My husband & I ordered a relatively small item from your company, a TV stand, and requested delivery. We purchased it at the beginning of December and were told it would not be delivered until after Christmas. This was fine. The delivery date was set for December 26. Both my husband and I were off that day so that was fine. We received a call saying they could not deliver that date, the new date would be Friday, Jan 4. Fine, but we could not be here in the morning. Now both my husband and I have spoken to your customer representatives and were told the delivery could only be in the morning, that the times are computer generated and NOBODY can change it, it’s based on our zip code. I can easily take a 1/2 off to be here in the afternoon but it is very difficult to be here in the morning (unless you want to come at 6:30 before I leave for work.) How difficult can this be to schedule a delivery at a time that is actually convenient for the customer? Keep in mind, I was already scheduled to be OFF on the first date. Someone from your company needs to contact me ASAP so we can either schedule this delivery at a time when I can actually be home or we will need to cancel this order. Please contact me via e-mail and leave a # for me to call you. I can only take calls at work when I’m not busy and I don’t want to miss your call so I’m not providing you with my cell number. I have been trying since August 2018 to get my automatic loveseat recliner repaired. Each time I call, there is additional information that is needed from me. As of 12/19/2018 the manufacturer has refused to send the needed part without the appropriate serial number. I sent the only serial number that is on the recliner to the Careteam2 on December 6, 2018. On December 19, 2018, I spoke with Danielle from Careteam2 who told me the manufacturer has stated that is the wrong serial number. I told her it is the only number I could find. She was going to call the manufacturer back and tell them to send the part of replace the recliner. As of 12/20/2018 I am waiting to hear back from Danielle. We purchased two recliners from Wayside Furniture in Joplin Mo Memorial weekend and got them the first of June. One of the recliners has a tear in the headrest part of the chair. I called Wayside and the said they were ordering a back for this chair and would replace it, this was the 15 of Nov. I have reached out to them by phone once and they said it hadn't come in yet they always say it will probably be on their next order. I called customer service with your company and they tell me they cannot replace just the back of the chair. This chair has not had any abuse it is just my husband and I no children to tear it up. I need this resolved what are my options, or am I stuck with a chair with a tear in the back? Please respond and let me know what my options are. I sent a complaint in a week or so ago and no response from you. I purchased two recliners Memorial weekend and got them the first of June. Over a month ago the back of one recliner split and cracked. I called the furniture store on the 15 of November and reported this to them. They said they would replace the back but haven't got this done at this time. What can I do about fixing this recliner. I called customer service and they told me they couldn't get just the back to this recliner. Please let me know what are my options. I give my first experience with Ashley Furniture one star for the wonderful sales lady that I dealt with. Other than that I would give the company negative stars if I could. We bought a vacation home in Arizona and made the mistake of trying to buy furniture to start filling it from Ashley in Illinois. They couldn’t coordinate an out of state sale and delivery so we had to call an Ashley in Glendale AZ. They advised that they didn’t take phone orders to to potential fraud. I did get a great sales lady who stayed she would process the order for an entire living room of furniture and put it on hold until I sent a check and identification, which I did. About a week later I got an email that they never got the check. Luckily I sent it with tracking info and it showed they had the check for 6 days before they finally found it. When the furniture was delivered we discovered a manufacturer defect on one of the end tables. It had a crack all the way around the edge of the table top that looked like someone took a black magic marker too in an effort to conceal it. I called customer service and was told to send photos. Two days later ai cslled and was advised theyvfidn’t Get the email so I sent it again. Three days later I called and was advised they didn’t get it, even though I had the correct email info and never received a failed delivery notice. I had the customer service agent email me and responded to it with the photos. They got them and, even though one photo showed a table with a crack around it and another in good condition, was told they have to call the store in Glendale to get a photo of a floor model in case the crack was supposed to be there. Really, does that mean the good table could actually be the bad one? They said they would call by the end of the day. Guess what, no call. I planned on filling a three bedroom house with their furniture but will not spend another dime with them after this comedy of errors. I think the nice sales lady needs to find a job with a reputable company instead of this Ashley circus. My recommendation is to run the other way. Last Friday I purchased a mattress and hydraulic platform from your store on I 10. I was to payoff within 6 months interest free. Because of a situation I went in yesterday November 17th to pay it off. The service I received from your finance department was abhorrent and disparaging towards me. The young lady Tiffany was rude and degrading towards me. I do not know why but I have never in my life been treated so badly and with so much disdain. There were other individuals who are witnesses to her unprofessional and personal demeanor. So I was publicly humiliated by her. I wrote two checks. The first one went through with no problem but the second one for some reason unknown to me did not. This had to be a problem with your system as it turns out. I asked what happened and she told me to in a surly attitude to call my bank. My bank is Morgan Stanley and I did so. My financial advisor stated there was more than enough money and she wanted to talk with them. I handed my phone to the young lady who did not even listen and said. It was not her problem the check was rejected. She then threw the phone at me and said how was I going to pay. I paid with my checking account to settle the bill. It goes on but I was so upset I told your manager about her attitude and I will probably never shop at ashleys again. This was a no late payment issue, nor was I trying to "get away" with something. Your sales representative, Fernando was great and my experience was good until I ran up against this finance person. Your store manager apologized and offered a discount on delivery. I explained that I was not looking for a discount but wanted them to know based on my experience with your finance department I will not be shopping there again. In my opinion you need to train your finance representatives in customer service etiquette. You also need to look at the check verification system because in this case it was totally wrong. My customer order number is 0082369960. On October 11, 2018, Jonathan Nowatka of the Southaven, Mississippi store sold me D Item 1485358, Pro Adapt FM Queen Mattress for $2799, D Item B280 - 581 Queen Metal HDBD/FTBD/rails for $299.99, D Item 1485373 Adapt Foundation Queen, and P Item 1484815 Dri-tec 5.0 Queen for $129.99. The total sale with tax was $3749.23. The delivery was set for October 20, 2018. 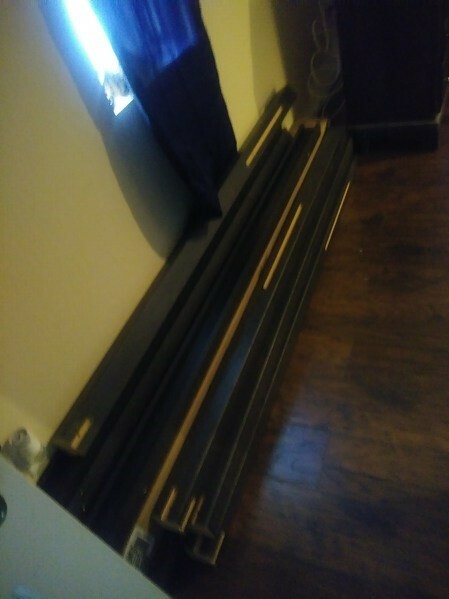 The bed was delivered with the rails. The warehouse sent the rails by one of its delivery men. The delivered flats DID NOT fit. At 9:04 on October 22, 2018, I call customer care (:04 a.m.) I left the message that they had the flats that was delivered did not fit my bed. I also inquired as to the time that they would deliver the correct flats. I did not receive a reply. I called Valeria at the Southaven store. I made her aware of the problem and informed her how disappointed I was in the customer care service that Ashley was providing. I also informed her that Ashley can come and retrieve its incomplete bed and mattress, or provide the bed free of charge. Valeria informed me that Ashley does not accept any returns. She went on to say that the finance office would provide a 10 percent discount of the final purchase price. The final purchase price was $3749.23. A 10% discount amounted to $374.92. I agree with that compensation rate that she stated. She also told me that me that the flats had to be ordered and therefore they would not be delivered that day which was Monday, October 22, 2018. I told Valeria that I tried to contact the Memphis office customer care, however, they had not contacted me. At 3:51 pm, a young lady from Memphis customer care contacted me. She stated that I would be receiving a new bed with rails and flats because Ashley did not have the flats to fit my bed. The delivery was set for October 26, 2018. On Wednesday, October 24, 2018, a driver for Ashley phoned me to say that he would be at my location in 30 minutes with the flats to my bed. I informed him that I was out of town and that my delivery was tentatively scheduled for Friday, October 26, 2018. I then called Memphis Customer Care. In fact, I called them twice. THE ABSOLUTE WORST CUSTOMER CARE I HAVE EVER RECEIVED. I LITERALLY BEGGED THE REPRESENTATIVE TO ALLOW ME TO SPEAK TO THE MANAGER. SHE PLACED ME ON HOLD, RETURNED TO THE PHONE AND DID NOT ALLOW ME TO SPEAK TO HIM. I hung up and phone Valeria at Southaven and made her aware of what was transpiring. An hour later, another Raven called from the Memphis Customer Care office and stated that I was scheduled to receive a new bed, with rails, and flats. She also stated someone would contact to me about the delivery. I received a text message indicating that my delivery was scheduled for Friday between 9:15 am and 12 o'clock. When the young men arrived, they came without the SIDE RAILS TO THE BED. They could not set the new bed up, instead, they took the flats that came with the new bed and placed them on the bed that was already set up. I thanked them and they departed. I am satisfied with my bed but I received my bill and the finance office has not applied the 10% discount. Please deduct the discount from my bill and notify the finance company of the new balance. Thank you. I was going to order on bed online and a salesman told be to order it with him. The bed was ordered on June 26, promise on July 6. I receive a headboard and canopy poles. Both item did not connect, against my wishes delivery men said they had to leave it. I was promised a replace to only find out that the bed was not going to order. Salesman tried to get me to change my bed for something that did not match my current newly bought bedroom set. He never followed up with me and his manager who was suppose to call never did. Three weeks into it I was left with no bed and pieces in my home. To top that off, i was being charged for the bed I never received. No one called me back. I had to demand to speak for a manager. I was told that I will continue to be charge until they received the headboard and poles back. They were suppose pick these up a week ago and they cancelled the pickup. Well this went on for almost a whole month. They finally came to pick up the items that were left behind. I received a credit back after I insisted on it. Why does ordering a bed have to be a nightmare. I received no compensation and a whole lot frustration and had to make follow up calls. I will not buy anything from Ashley Furniture again at a store. I feel I should have received compensation for the poor way I was treated. I received the laflorn chairside table the numbers on the box are T127-553. The shelf and brackets to hold the shelf in place did not get sent with the table. This was an online purchase. I sent an email and have not received a response. When you spend over $200.00 for a table you expect everything to be there. This is the first time I have purchased anything from Ashley Furniture and if I don't receive the shelf and brackets you can bet I will never purchase another thing from Ashley Furniture. I work in retail and come in contact with a lot of people on a daily basis. I can spread the word about this if it is not taken care of. We ordered our furniture on 3/2/18 with an expected delivery date of 4/4/2018. The 4/4 delivery date never happened and I received a text from Ashley stating " production delays and that one item was still back ordered". The delivery was rescheduled for 4/11. On 4/10 I received three different phone calls from Ashley giving me three different delivery windows. I called the local store complaining about this. This store was in Arcadia, Wisconsin the headquarters. On 4/11 my delivery showed up. One of the items had been damaged inside the truck and the driver didn't bother to offload it and after seeing the picture he took I understood why. Shortly, after the left I went to rock in one of the chairs and it had a loud thumping noise. My wife then called the consumer customer care line the same day about the chair. I could hear most of the conversation and I will tell you that the employee on the phone was in the wrong position has he didn't seem to care about our problem but never the less he said someone would be out on Monday 4/16. He went on to say we had refused delivery on one piece of furniture and we told him this item had been damaged in the truck. I would have expected a phone call from Ashley by now telling me when the replacement piece would be delivered. as of this writing I have no ideal of what is going on? This was my first and probably last buying furniture from Ashley. Customer care after the sale seems to non-existent. I will await your response before considering posting my experience on all social media sites and letting friends and relatives know of my experience. I ordered some furniture from Ashley Furniture thru “American Liquidators Inc.” New Jersey, month of November 2017, so for not settled my furniture problems. 1. When I ordered table tops they (Ashley customer service) said “real granite stone”. After confirm I ordered complete set. When I received it is not real granite stone, it is plastic. This is big cheat, and some furniture is also with scratches they delivered. I want only “real granite stone” table tops only. Please replace them immediately. 2. When they delivered, one corner table was broken. So for they not replaced. I am contacting with American Liquidators Inc., but Ashley’s salesperson not showing up inspecting the broken corner table. I paid already this piece, so please deliver to above address immediately. Please take immediate action and solve the problems. My furniture has not been delivered as promised! Purchased item through financing at the store on February 23, 2018, and no phone call or furniture! Called the store on March 17, 2018 and was told that there maybe was some miscommunication! Furious is an understatement of how I feel! This is not professional by any means! Then was informed that I have to still wait longer! Unacceptable! I purchased a bunch of stuff at May 14th, including a sofa, a table set and a rug, from Ashley Furniture Homestore ( 4500 San Felipe St, Houston, TX). It's been nearly half a year I still haven't got my rug! All things I bought had different delivery method and date. I should have been warned and stopped my business with them when their sales people even couldn't settle right deliver method for the sofa. I called to try to figure out where my rug is for the first time around 7/4, and was told that the order was shipped on 6/20 and would take four to five weeks to arrive. The customer services person verified the delivery method and address: directly ship to my apartment. Then I called again at the beginning of Aug as it was not delivered. They repeatedly told me the ship date and said they did not have any tracking information. That was unbelievable to me, how could they not have tracking info? That time the customer services assured me the rug would be deliver to my apartment soon. I was told to wait. After long long wait I called another five or six times. No one knew where the order was and they insisted that it was delivered. They started lie to me saying it was delivered but they didn't have tracking info. Once the customer service directly hung up on me without letting me finish my sentence. I verified delivery method and address with them each time and everything was correct. The last call was made on 9/15. Finally, they figured out the rug was delivered to the store instead of my address. I called them so many times they kept telling me it would ship to my address but then they said they made mistakes so many times, it was already at their store! I asked for re-shipping to my address and was refused with the reason "do not have the responsibility to ship third-vendor products". Their services are just so rude. I file a complaint and they just deceived again telling me they already delivered it to me and if I didn't get it, it was the Express Company's responsibility. They want me file a claim with the Express Company. I cannot believe they played cheap trick to get off from their responsibility. We purchased Ashley furniture at you Pekin store in Illinois. And we paid cash. We went to cancel part of the order and was told we would have to wait seven to ten day to receive a check for the canceled furniture. That's not right. It didn't take us seven to ten days to pull the cash out of our pocket to give then. I will for warn everyone how they do business. And further more we were told we would have the furniture around the 25th of July and still are waiting to hear from the store and here it is the 16th of August. Maybe someone needs to see what's going on at that store. I for one am turning to Facebook to spread the word about that store. We went to Ashley Furniture (Kennewick, WA) store on the evening of 3/12/16. A gal by the name of Linda helped us begin our search for living room furniture. She was carrying tables, lamps etc over to the furniture we were deciding on in an effort to satisfy us. We told her we were going to look at a few more places and kind of sleep on it. The next day, after we had been to a few other furniture stores, we came back to Ashley. A guy named Cruz began to help us we let him know that we had been there the night before and unfortunately, couldn't remember the gal's name that helped us because we left her card at home and we had been to other places and simply lost track of her name. We proceeded to describe her to Cruz, but he didn't seem to be interested in getting her or figuring out who it was. Furthermore, he rubbed us the wrong way...we weren't real pleased to be working with him. We looked around to see if we could see her, but unfortunately we didn't. Assuming perhaps she wasn't working today, we allowed Cruz to continue helping us. We also assumed, he would do the FAIR and right thing and at the least share the sale. As our decision making was coming to a choice of what exactly we would be purchasing, (after she helped us to come to the decision of WHAT furniture and end tables to choose from the night before) we began our purchase process. As Cruz was handling the finance paperwork, we were looking at lamps when we actually came face to face with Linda! We told her that we were working with Cruz but only because we didn't see her but that we wanted her to have credit for the sale since it was definitely her tireless help and patience (for 2 hours) helping us choose the furniture we were purchasing. About half an hour later, we saw her again and I asked her if she was able to talk to Cruz and if she was getting credited for part of the sale. She answered, and might I add 'No' with a smile on her face then turned to help some other customers. After our initial shock, it turned into all out disappointment and frankly irritation. So we made the decision, after discussing it between ourselves, to find the manager and let her know the importance of making sure she was somehow credited for this sale. As we spoke to the female manager, (whomever was managing this store on 3/13/16 between the hours of 2:00 pm and 5:00 pm) she looked us straight in the eye and expressed her concern for an employee who would take credit for another salesman's customer. She said she understood our concern and would address it. So we went back and sat down and awaited the paperwork to be done thinking Linda would be getting credited for the sale. After all the paperwork was finished and they approved us, we then had another 45 min wait (unsure why, probably just inputting our info as to what we bought) so we were waiting on the couch near the front desk. As we were talking, Linda happened to come past us, I said, "Hey Linda" she looked up and acted as though she didn't want to talk to us but I insisted. I asked her about why they charge a delivery fee and she explained that they contract with another company and that is why the fee. I then asked her if her manager had talked to her....she looked very confused as to why I knew her manager talked to her. We discussed whether we should talk again to the manager but felt that this woman may lose her job under management such as this, so we left it alone. We also discussed whether to cancel the sale and just go elsewhere (this is still under consideration) but unfortunately we had been there for a few hours, had other things to do and wanted to be on our way. We are hoping by contacting you, somebody can talk to the correct chain of command and make this right! At this point, the manager at Ashley furniture should be fired. We did the right thing for Linda, our salesman, by making sure the manager was aware that she was our initial sales lady, but that manager did the wrong thing. We feel that if that woman manager (bigger blond lady) could be that bad, then she could very well be screwing customers in furniture deals, in turn, making Ashley Home Store look deceiving, dishonest and unethical. It is our opinion her behavior was reprehensible and unacceptable as a manager. Our experience tonight left a very undesirable taste in our mouths. We are hoping by contacting customer service, this manager will be reprimanded in some way and that Linda will get the credit for this sale. I have purchased several chairs and sofas from Ashley furniture over the years. The only corporate complaint I have about Ashley so far is really their sales process. It's exhausting to go into a store and have a sales person give you their phone number, email address, and try to hard sell you on something. I really just want to shop at my own pace without the added pressure. Ashely Furniture has a good collection of furniture and I must say they understand the exact needs of a home. Keeping in mind about my requirement for a good dining table set and something that suits my home, AF was able to show me a variety of collection. I had made my purchase after going through their collection and received many complements for such classy furniture. Thanks to AF for this. The executives who work at AF also are quite friendly and patient enough to guide us giving options to choose from their collection. Have feedback for Ashley Furniture?